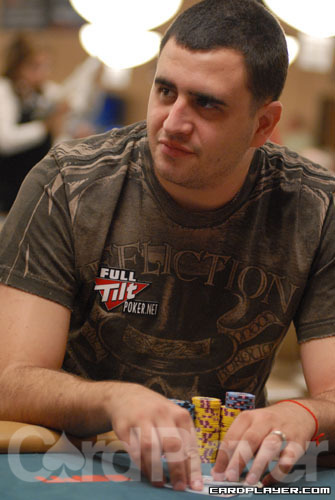 Michael Mizrachi raised to 200,000 from the button and Vladimir Schmelev re-raised to 750,000. Mizrachi moved all in and Schmelev called. The Grinder’s tournament life was in the dealer’s hands. Mizrachi showed A 7 and was trailing Schmelev’s A J . The flop made things interesting, coming K 9 10 to give the Grinder the nut flush draw. The Q turn gave Schmelev the broadway straight, but he still wasn’t out of harm’s way. When the 5 hit on the river, Mizrachi’s posse erupted to celebrate his flush and double up. The stacks were pretty much even after the hand, with Mizrachi holding 8.8 million to Schmelev’s 8.6 million. After trading hands and keeping the chip stacks relatively even for much of the level, the Grinder began chipping away and then took a big chunk of Schmelev’s chips in one sudden hand. Mizrachi raised from the button to 225,000 and was called by Schmelev. Both players checked the Q 8 A and again on the 3 turn. On the 3 river Schmelev bet out 250,000 and Mizrachi over-raised hugely, to two million. Schmelev called and Mizrachi excitedly threw down the 3 2 for trip treys. Schmelev mucked and was crippled with around 600,000 after the hand. Mizrachi moved all in and Schmelev couldn’t afford to fold. He called and had to be pleased to see he was a big favorite, with his Q 8 out-kicking Mizrachi’s Q 5 . The flop left several outs for Grinder, coming 9 6 4 . The Grinder-heavy rail chanted for a “Five!” and sure enough, that’s exactly what they got. The 5 hit on the turn and the place went wild. The Grinder pumped his fists but then realized the hand wasn’t over and motioned the rail to calm down. When the 4 hit on the river, it was official: Michael “The Grinder” Mizrachi was the winner of this year’s Players Championship, and finally an owner of a WSOP bracelet, taking home $1,559,046. The Russian, Schmelev finished the Players Championship with a strong second place, earning $963,375 along the way. 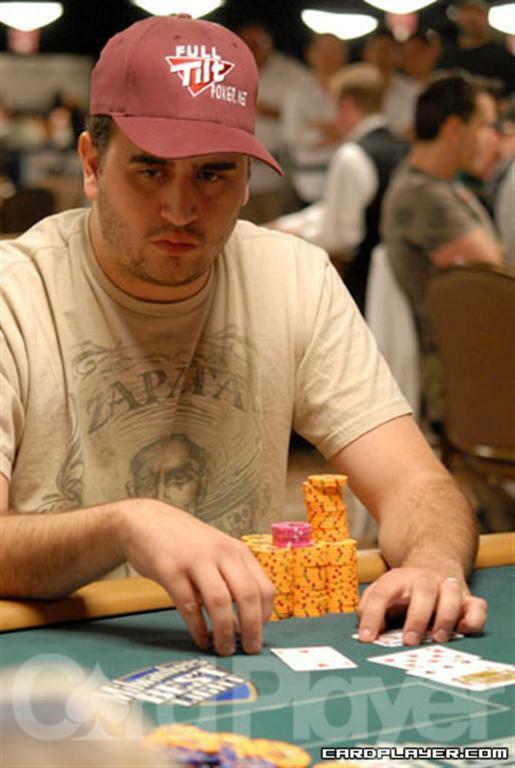 Formerly the low stack at the table, Michael Mizrachi used the previous level to put himself right back in the thick of things. Early in this level, he has only continued his grind to the top. In one hand he was heads up in a limped pot with David Oppenheim. On a flop of 7 6 7 both players checked. Mizrachi bet 150,000 on the 2 turn and Oppenheim made the call. When the Q completed the board Mizrachi bet 280,000 and Oppenheim took his time before calling. Mizrachi showed 6 4 for two pair and took down the pot. Two hands later the two locked up again when Oppenheim raised to 260,000 from the button and Mizrachi called from the big blind. The Grinder checked the 5 9 2 flop and so did Oppenheim. The 9 came on the turn and both players again checked, bringing up the 8 river card. This time Mizrachi led out with 500,000 and Oppenheim insta-called. Mizrachi showed Q 9 for trips and took the pot and with it, the chip lead. Vladimir Schmelev raised to 225,000 from the button, only to have Michael Mizrachi reraise to 600,000 from the small blind. David Oppenheim reraised all in for 2.7 million and Schmelev got out of the way. The Grinder tanked, eventually calling him down. Mizrachi showed K Q and was in a classic coin flip against 8 8 . The flop was no help to Mizrachi, coming 9 6 4 . Neither was the 7 on the turn. But when the Q hit on the river, the Grinder fan club went wild. Grinder connected for a pair of queens to send Oppenheim to the rail in third place. Mizrachi now has 10.9 million in chips â€” a solid chip lead over heads up opponent Schmelev. Michael Mizrachi raised to 245,000 and Vladimir Schmelev re-raised to 790,000. Mizrachi made the call and the flop came 3 9 Q . Schmelev led out with a 1.1 million bet and Mizrachi made the call. Both players checked the Q turn and the river brought the 6 . Both players checked again and Schmelev sheepishly turned over 8 6 to show that he had been firing with air but connected for a pair on the river. It was good enough to take the pot of around 4 million, and with it the chip lead. 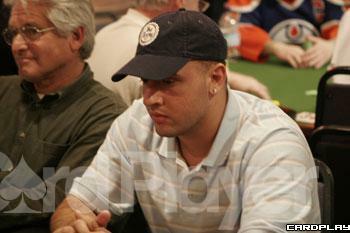 Michael Mizrachi raised to 200,000 and got one caller in Vladimir Schmelev. Both players checked the flop of 4 A 10 and the A hit on the turn. Schmelev fired 200,000 and Mizrachi called. The Q hit on the river and this time Schmelev slowed down and checked. Mizrachi fired 375,000 and Schmelev called. Mizrachi showed Q 10 for two pair and Schmelev mucked. The pot put Mizrachi right back in the mix of things with around 4,600,000 in chips. He continued to “grind” his way back up throughout the rest of the level and currently sits with 6,100,000 in chips, good enough for second. David Oppenheim raised to 230,000 from the small blind and Vladimir Schmelev called from the big blind. On a flop of K 7 5 Oppenheim fires 300,000 and gets a call. The 5 hit on the turn and Oppenheim checks. On cue, Schmelev bet 350,000 and Oppenheim makes the call. On the J river both players checked and Oppenheim showed A A to win the hand. 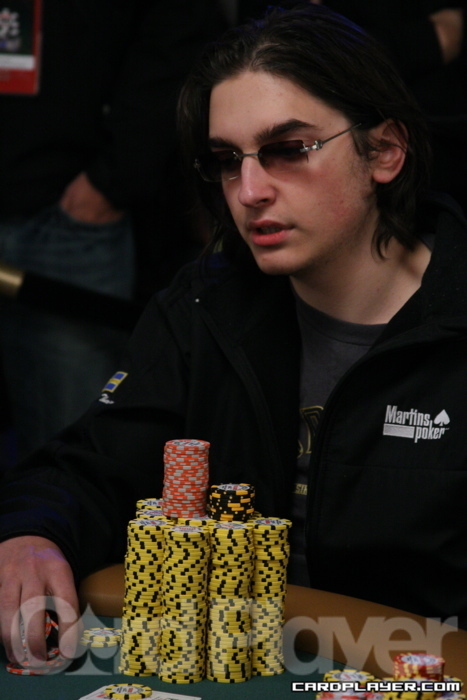 David Oppenheim started the day with just 460,000 in chips, far and away the lowest of all remaining players. Since then he has worked his way into a runaway chip lead. His latest victim was the Grinder. Oppenheim raised to 175,000 and was called by Michael Mizrachi. On a flop of Q 4 5 . Oppenheim led out for 235,000 and Mizrachi raised to 735,000. On the 8 turn Oppenheim checked and Mizrachi fired out a cool million bet. Oppenheim moved in and Mizrachi called to see the bad news. Oppenheim showed 4 4 for a set, and was way ahead of Mizrachi’s A Q for top pair. The 2 river gave the pot to Oppenheim, who now sits well above the rest of the table with 8.3 million in chips. Mizrachi is down to 1.1 million. Michael Mizrachi raised to 200,000 and brother Robert moved all in for 465,000. Michael made the call and they showed down their hands. Robert was still a favorite after the 8 2 3 but the J turn gave the Grinder a pair, and he hung on through the 2 to eliminate his brother in 5th place. John Juanda moved all in for his last 1.3 million and Vladimir Schmelev called. Juanda had K 9 , holding one over-card to Schmelev’s 10 10 . The flop came A A 4 . The 3 turn and Q river didn’t improve Juanda’s hand and he was bounced in fifth place. Schmelev had around 5 million after the hand. David Baker raised preflop to 140,000 and short-stacked Mikael Thuritz threw his last 55,00 in, while Michael Mizrachi called from the big blind. On a flop of 6 6 4 Mizrachi checked to Baker, who fired 180,000 only to have Mizrachi check-raise to 400,000. Baker folded and Thuritz saw the bad news. His Q J was hugely behind Mizrachi’s 6 4 . The 8 turn and A river was all she wrote, and Mizrachi eliminated Thuritz in 8th place. Robert Mizrachi raised to 140,000 and brother Michael called from the small blind, marking the first pot of the tournament they have been heads up over. On a flop of 9 5 4 Michael fired 150,000 and Robert made the call. Michael checked the 2 turn and Robert bet 400,000. Michael folded and Robert won round one the first Mizrachi battle. 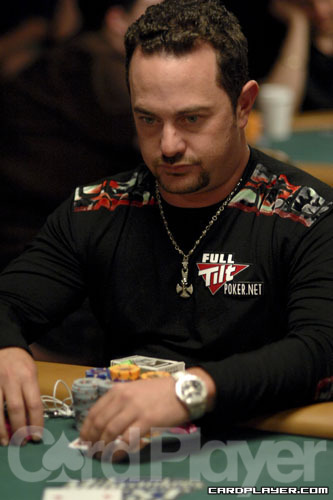 Michael Mizrachi raised to 150,000 preflop and was called by David Baker in the big blind. On the flop of Q 10 3 Baker checked to Mizrachi who bet 300,000. Baker check-raised all in and Mizrachi made the quick call, showing Q 10 for top two pair. Baker showed K 10 for middle pair and was in trouble. The 6 turn and J river didn’t help Baker and Mizrachi doubled to 2.7 million. Baker dropped to 1.8 million. 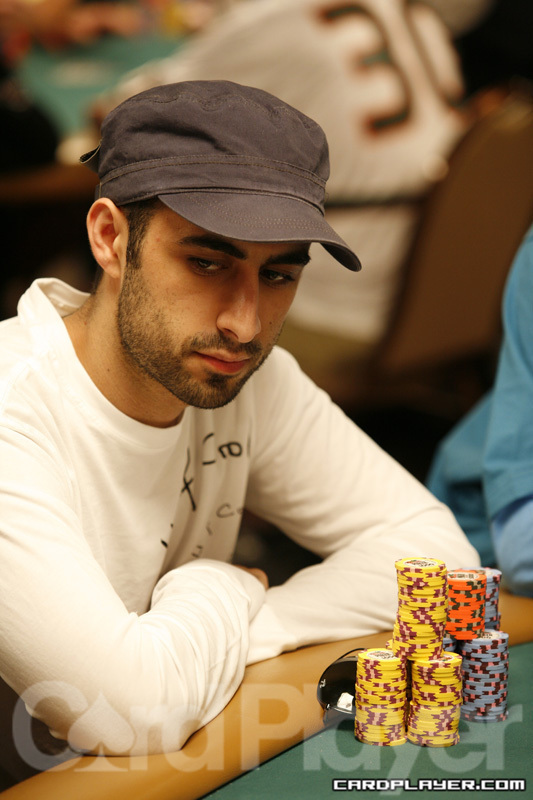 Daniel Alaei lost most of his chips in a back and forth thriller against David Oppenheim. Oppenheim raised to 225,000 and was called by Alaei. On a flop of K 10 4 Alaei moved all in and Oppenheim called. Oppenheim showed A A and was well ahead of Alaei’s K Q . The turn was the Q , giving Alaei two pair and the lead. But the river brought the 10 to give Oppenheim a better two pair. The loss dropped Alaei to 225,000. Soon after he got in with pocket 7s against the pocket 6s of Oppenheim to double back up to around 800,000. Daniel Alaei got his last 410,000 in the middle and was called by Vladimir Schmelev. Alaei showed A 6 and was trailing Schmelev’s A K .
The board ran A 8 3 Q 4 and Alaei was eliminated in 7th. 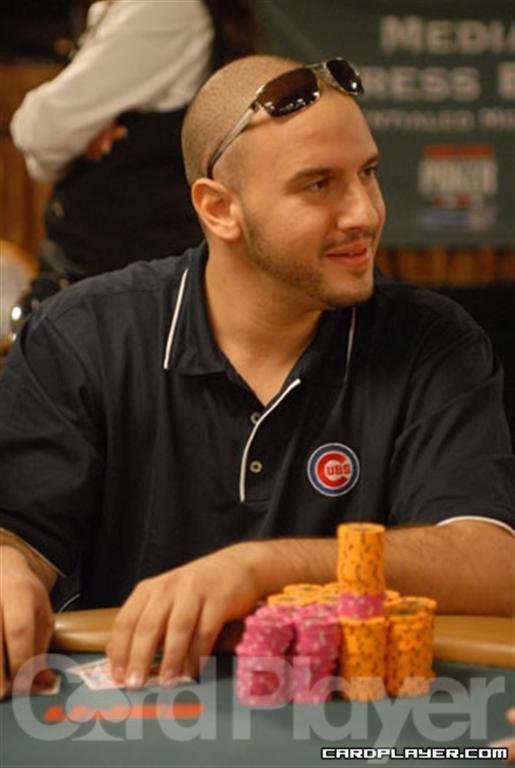 Facing Michael Mizrachi’s raise to 145,000, David Baker moved all in from the small blind and the Grinder called. Mizrachi’s A K was ahead of Baker’s A J , and the board of 10 K 8 6 4 didn’t improve Baker’s hand, sending him to the rail in 6th place while the “Grinder!” chants erupted from his cheering section. Facing a 110,000 raise from Mikael Thuritz, Daniel Alaei moved his last 1.325 million all in from the big blind and Thuritz moved all in as well to get John Juanda out of the way. Alaei showed A K and was in a classic race against J J . The flop was no help to Alaei, coming Q 10 4 . But the A turn card gave him top pair, and the 6 ensured his double up to around 2.7 million. David Oppenheim started the day with 460,000 in chips. After raising all in on several early hands to take the blinds, he got action and doubled up through David Baker. Oppenheim raised preflop to 110,000 and Baker reraised to 375,000. Oppenheim made the call and the K 10 5 came on the flop. Oppenheim checked to Baker, and when Baker fired 500,000 Oppenehim moved all in and was called. Oppenheim showed A A , and was dominating Baker’s 7 7 . The 9 turn and 4 river gave Oppenheim a double up to 1.8 million. Mikael Thuritz got all in against Michael Mizrachi on a flop of 9 7 6 . Mizrachi showed 10 6 and was trailing Thuritz’s Q Q . The 4 and the K finished the board and Thuritz doubled up. Mikael Thuritz had to feel good getting all in preflop with K K . That is, until he saw Vladimir Schmelev’s A A . The board ran J 4 4 A 8 and Thuritz was crippled to around 5,000 in chips, while Schmelev’s stack soared to 3.3 million. Soon after, Thuritz quadrupled up and stayed busy in later hands but he was still dangerously low going into break. The cards are officially in the air in the exclusively No Limit Hold’em final table of the $50,000 Players Championship, following 4 days of mixed game action. After a delay to get ESPN crews ready to film the action, blinds are starting at 20k/40k. Stay tuned as CardPlayer.com brings you all of the live updates from the dayâ€™s action. Final table Set For 3 p.m. The final table for the players championship set to get underway at 3 p.m.
Robert Mizrachi enters with a slight chip lead over David Baker. A big storyline for this table is the presence of Mizrachi’s brother, Michael, just a couple of seats over. They are separated by the short stack, David Oppenheim. It is very possible the brothers Mizrachi will be sitting shoulder to shoulder early into play. The play will switch from an eight game rotation to no limit hold’em exclusively. The first player eliminated will make $182,463 and the winner will take home $1,559,043 and the Chip Reese Memorial Trophy. Stay tuned as we bring you the live updates from all the final table action at the Players Championship. For up to the minute information straight from the player’s themselves, be sure to check out the Card Player Twitter page.